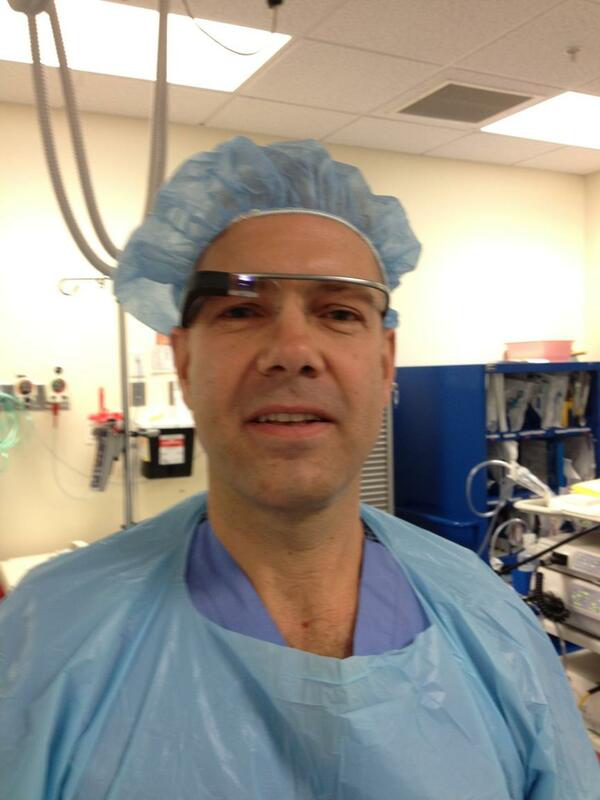 “OK Glass: hand me the scalpel, please…” GoogleGlass during surgery! Obviously, one of the MAIN concerns regarding the use of Google Glass during surgery, with live streaming of data, would be to take every measure and to ensure the privacy of the patient’s health information (PHI). That’s exactly what I did. Not only I obtained informed consent about what we were going to attempt (and documented it), but most importantly, made sure that no recording or transmission of any identifying information was done. 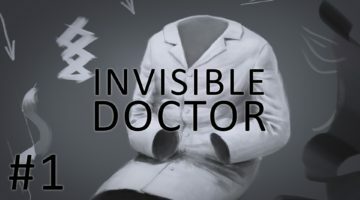 The streaming of video and photos, to “myself” thru Google Glass, did not reveal any PHI, or even show the patient’s face. By performing and documenting this event, I wanted to show that this device and its platform, are certainly intuitive tools that have a great potential in Healthcare, and specifically for surgery, could allow better intra-operative consultations, surgical mentoring and potentiate remote medical education, in a very simple way. To my knowledge, this is the first time that Google Glass has ever been used during live surgery, by a surgeon, and Glass Explorer, with streaming of non-identifying patient information thru a Google Glass Hang-Out. The patient involved needed a feeding tube (Gastrostomy) and we chose to placed it endoscopically, with a procedure called PEG (Percutaneous Endoscopic Gastrostomy. You can Google that to learn more…). Being the first time, I wanted to do this during a simple and commonly performed procedure, to make sure that my full attention was not diverted from taking excellent care of the patient. I arranged for a Google Hang-Out (HO) between my Glass and a Google account I created ahead of time for this very purpose. The connection is remote. The iPad used as a receiver was just yards away, but it could have been practically thousands of miles away. Before starting the operation, I briefly recorded myself explaining the planned event, and once again, talked about the importance of not revealing any PHI. I had Google Glass on at all times, with the HO active thru-out the procedure. The live video images that I saw thru Glass, were projected in the iPad screen, remotely. We kept the volume down on purpose. We tried to keep it very simple (the KISS principle!) and straight forward. As I said, even the procedure was a simple one. The whole thing was fairly quick and went very well. We used “home-made” techniques, so the pictures and video are not optimal, but I think the point stands: Google Glass Streaming During Live Surgery…By a Glass Explorer Surgeon…IS POSSIBLE. OK Glass: hand me the scalpel, please” ! I can’t wait to help you make this more than just a public videostream. Well done!!!! As one Google Glass Explorer to another, you have climes a clinical mountain!! Saludos Rafael!! Excelente aportación para el campo mHealth!! Espero con anhelo los próximos trabajos. 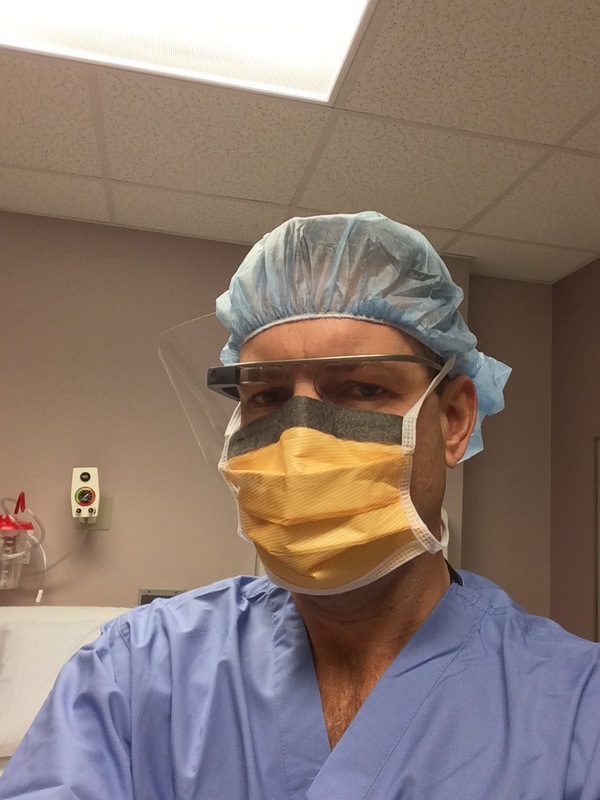 You are obviously in a much better position than I am to influence the direction of Google Glass in the OR suite. I was an OR tech in the US Army for several years and as soon as I saw a demonstartion of what Google Glass can do it became readily apparent to me how beneficial it would be for a surgeon to have a hud display of the patients vitals similar to the hud display fighter pilots have. I sent the Google Glass team an email with the suggestion since you’ve had the chance to wear them during surgery do you think it would be a benefit or a distraction to have that kind of information available to you? 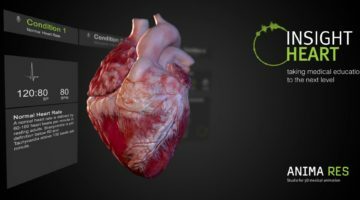 The other use that I believe could prove very beneficial would be a realtime superimposed 3 dimensional display of the patients arteries and veins through which a surgeon could navigate their incisions and tissue dissections to limit blood loss during surgery. If you believe any of the ideas I mentioned to be viable you are in a much better position to get the Google Glass teams ear. ” I think that there should be ways to directly stream the endoscopic view thru Google Glass” …. You have highlighted one of the major queries regarding an Android-based HUD. How does one get live video content onto the display other than from the camera ? ‘Old-school’ consumer see-thru HMDs allow you to plug in a video signal cable (or send it via a wireless video sender). The means of getting live video into Android are clunky to say the least, and video quality deteriorates. Unless Google are hiding something, the Glass was not designed to do what you want to achieve with external video input from your endoscopy system. Maybe the Glass and endoscopy video would have to be mixed live on another platform and broadcast from there. Would that be practical when the screen size is equivalent to a 25″ monitor from 8′ away? I wonder if the detail would be there. As far as streaming goes,unfortunately google used bluetooth 2.1 EDR which only has a reliable bandwidth of 2.1 megabits/sec – which wont do well for video streaming… but helps with battery life. The new bluetooth 3.0 HS standard can support 25megabits/sec which would stream HD video. That leaves wifi as the primary source of streaming to the google glass device which would probably prove unreliable, be complicated, likely require new endoscopic hardware that probably doesn’t yet exist, and have latency issues. Dr. Grossmann- I applaud your visionary efforts in using Glass in the OR. I am a neurosurgeon and just picked up my Glass yesterday- I plan explore its operative uses as well, and would be interested to know the details of your setup, and what you’ve learned so far. Please feel free to contact me. Dr Grossman, While I applaud your innovation and the possible future use of this device to teach and learn, it is apparently not your priority to use universal precautions during surgery for the safety of the patient. The video of you that was online at the Bangor Daily News website revealed that someone told you to take your surgical mask off, which you did. You kept your plastic splatter shield on though. That protects you. Then further views of the surgery revealed that a second male with facial hair, also had his surgical mask dangling under his chin. Both of you were at/over the patients abdomen and fresh surgical site. Also a third person…a female, was in this video with no mask on. This is a patient safety concern and this video should not be used as an example of anything because of that. Universal precautions are not just to protect providers/surgeons, they are also to protect the patients. I sincerely hope that the patient does not get an infection. Thxs for the comments. This procedure is normally done at the bedside, it is not a sterile one. I’m entering the patients oral cavity and then the esophagus and stomach. The only sterile technique happens at the abdominal site, when prior to making the puncture, the area is cleaned with antiseptic solution and the assistant wears sterile gloves and uses sterile equipment. As soon as the stomach is entered that sterile field is violated. The patient receives pre-procedure antibiotics always, and even that routine step, is controversial in the literature. No one, except the assistant, is required to wear hat, sterile gloves, mask or even gowns. As you mentioned, the only reason we do it, is to protect ourselves from the patient’s oral secretions. this post gives nice understanding even. Excellent tool for teaching, and also documenting for legal purposes during surgery. Today’s inexpensive storage makes it possible to record anything to be archived via You Tube or many other systems in house. About 14 months ago I sponsored the first live HOA for a thyroidectomy (HIPAA Compliant) At that time we had to strap a web cam to the surgeon’s head (worked okay, but primitive mechanically) I wished then we had a device like Google Glass. The surgeon or another person can report running commentary. It is even better when there is a separate moderator/video producer who controls video from Google Glass and another camera in the O.R. showing various other components, and/or devices being used…Digital Health Space specialized in these events about one year ago. We arrange for planning, video production, informed consent, hospital permissions, and legal counsel preparatory to any broadcasts. Many of our programs are HOA with from two to ten participants. The events are registered in Google Events. Invitations are limited for the HO, but anyone can watch. It’s been interesting that both your team and mine have used the Google Glasses in the operating room and claimed so on the media within a few hours of each other. I was in fact surprised when, on the night of the 22nd, I googled “Google glass surgery” and came across your blog. I sincerely like the way you conducted both the surgery and the communication of the feat, which you mention to be a “…Poor’s man’s …“ set up. However, I feel obliged -by the very different nature of the technological conditions under which both experiences took place- to clarify that both occasions where world-premiers, on their own. And I do so out of respect for the many people who have been working hard for weeks, prior to our surgery, who also deserve to be recognised and acknowledged. Prior to surgery, engineers from Droiders, manily Julian Beltrán, had already performed multiple tests on the hazards of using the glasses in the Or, had also checked that Wi-Fi connections and broadcasting over the internet was possible and I myself had tried the glasses during a small surgery procedure and broadcasted it to our private streaming server, all in preparation for an open broadcast. We also posted it in our blog, just as you did in yours, and even recorded a test performing a wireless arthroscopy on a pepper. We didn’t consider that to be an exceptional achievement since it was no more than recording and sending images to our streaming server, something which has been possible to do for a while back with easily available small-sized cameras, held over your head. What we considered outstanding, and thus divulged in the media was that we managed to perform a complex surgery procedure (chondrocyte implant) while keeping constant communication with a medical team 5800 miles away, who could follow the surgery and observe the same field of view the surgeon was having as well as advise or ask him on-the-go, as he operated the patient. Here you can watch the surgery. We considered this to be a great deed since it can open doors to telemedicine applications: a non-experienced surgeon under extreme circumstances might start a surgery and directly contact a more experienced physician thousands of miles away, taking heed of his advice; or maybe consulting a medical atlas, charts, or images belonging to the patient on your own glasses when you are operating, should you need them. Since what you did when you performed your gastrostomy had been performed by our team on previous days, and considering the fact that our surgery was actually aired live over the internet to an open audience and where other teams have been able to participate on the surgery, we claim, in all fairness, our team’s premiership. 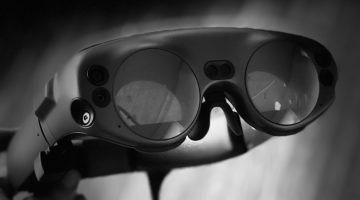 This is where the real complexity of the matter lies – to stream contents live from Google glasses to an on-line audience- and being the first team ever to evidently do so. We hope you recognize our fair rights in this landmark, and you have our most sincere support in reaching your next milestone on this race towards Google telemedicine before we do. That will be fair as well. Dr. Guillén. Aplaudo su logro con pasión desde aquí en los EEUU. De verdad los felicito. Como ya lo he escrito antes en varios espacios, , no se trata de una carrera, sino de divulgar el potencial de una tecnología como esta que tiene un alcance formidable en muchas áreas, incluyendo la nuestra. Soy un “Glass Explorer” y como tal vez lo sabrá, desde el comienzo de este año he escrito y hablado en múltiples instancias sobre mi pasión e interés por GoogleGlass aplicado a medicina y a la educación médica. Tal vez sabrá, espero que así sea, que Julián Beltrán y yo llevábamos tiempo también hablando y planeando aplicaciones. De hecho, yo puse a Julián e contacto con un buen amigo de Stanford, el Dr. Homero Rivas quien entiendo también fué parte de su experiencia. Me hubiera gustado a mi también ser parte de ella, seguramente hubiera podido aprender yo mucho y tal vez aportar algo. De cualquier modo, como le dije antes, para mi no es una competencia sino de difundir las buenas nuevas y aportar al mundo visión de las posibilidades. Que la prensa y la medios peleen entre ellos y decidan si ellos quieren. Por mi parte yo sigo trabajando ( sólo por aquí y con apoyo de nadie desgraciadamente!) y deseoso que en un futuro cercano podamos tal vez unir esfuerzos. why is the youtube video marked private? Muchos profesionales exitosos han abandonado nuestra hermosa patria y se han convertido en ejemplo a seguir en tierras extranjeras. fantastic post and a all round entertaining blog (I also love the theme/design), I don’t have time to browse it all at the minute but I have saved it and also added in your RSS feeds, so when I have time I will be back to read a great deal more, Please do keep up the fantastic work. Really appreciate your kind comments. Thanks. Te agradecería mucho que el 17 de septtiembre de este año, a las 16.00 (hora española), pudieras recibir las imágenes de la Master Class on Surgery sobre una cirugía de Implante de Condrocitos Autólogos cultivados sobre membrana y aplicados con artroscopio sin cables, usando Google Glass. En la web de retransmisión habrá tres pantallas (cámara de sala, google glass y artroscopio), de modo que la información que llegue al espectador sea lo más completa y educativa posible. Estoy muy ilusionado de que tú en persona veas y comentes la retransmisión a través de las google Glass. Contaremos además con la presencia de Homero Rivas. Escríbenos al email si necesitas información más precisa del evento. Me encantaría ser parte de este proyecto, y contribuir con ustedes en lo posible. He hablado con Julián acerca de él y se ve muy interesante. Voy a revisar mi calendario, en específico la hora pautada. Te agradezco muchísimo tu deferencia y la invitación. Ya aparté al menos una hora en mi calendario, para este gran evento. Esto sería a través de un Hangout? Tienen que agregarme a la lista de contactos en Glass? Ya Julián me tiend a mi en esa lista, en caso de que estemos usando sus GoogleGlass. Fantástica Página Web .Sigue adelante con este excelente trabajo. Contiene un contenido realmente excelente sobre el tema y tus mensajes son bastante acertados. Posiblemente tienes el mejor sitio de internet sobre el tema. Muchas gracias. De verdad que aprecio mucho tus comentarios. Very appreciative of your mentions!! !